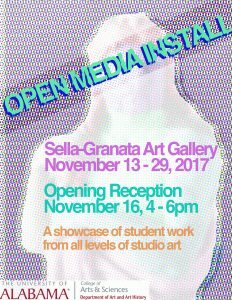 The Department of Art and Art History proudly presents the exhibition, “Open Media Install,” November 13 – 29, 2017, in the Sella-Granata Art Gallery in the heart of UA campus on Woods Quad. A reception for the artists will be held Thursday, November 16 from 4 to 6 pm. This first-of-its-kind exhibition showcases the breadth of student art work at UA. Faculty from each of our studio concentrations and our Foundations area have selected work by undergraduates and graduates to showcase. 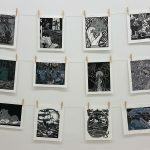 “It’s exciting to see our students’ talent and hard work over the last year gathered together in this huge show,” said Allison Grant, assistant professor of photography, one of the organizers. 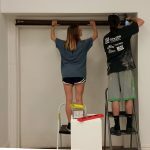 The work, hung high up the walls in the traditional salon style of 19th-century academic exhibitions, highlights of the students’ creativity and technical skill in media in the areas of Ceramics, Digital Media, Drawing, Foundations, Painting, Photography, Printmaking and Sculpture.